Former President Yameen Abdul Gayyoom had utilized the funds embezzled from Maldives Marketing and Public Relations Corporation (MMPRC) for personal benefit, confirms the police. In a statement released by the police on Wednesday night, they revealed that an amount of $1 million was deposited into President Yameen's account by SOF Private Limited, whose account was used to move around the embezzled funds. Upon investigation, it was identified that the funds were supposed to be deposited into State accounts, and President Yameen was subsequently asked to transfer the funds back to state accounts. However, President Yameen had not obliged with the request. It was also identified that the funds were utilized for personal benefit, and moved around between his accounts in ways that could generate financial benefit. President Yameen was recently summoned to the police headquarters where he was grilled regarding the deposit made by SOF Private Limited into his personal account. A case of money laundering against Yameen has already been sent to the Prosecutor General's Office by the police. President Yameen continues to insist his innocence, and claims that no authorities has deemed all the funds in the SOF account as unlawful. He further requested authorities to publicly announce not to accept any financial transactions from SOF Private Limited if that were the case. "No authorities have confirmed that the funds in the SOF account corresponds to the funds embezzled from MMPRC," Yameen said adding that he does not even believe that he was obliged to pay back the amount to ACC from his own accounts. The official audit report into the Maldives Media and PR Corporation (MMPRC) scandal, had revealed that over USD79 million had been embezzled through the state tourism promotion company. The funds received by MMPRC was distributed through a private company called SOF Private Limited with strong links to the now jailed former vice president Ahmed Adheeb Abdul Ghafoor. Shortly after the scandal was uncovered, USD 1 million was deposited by SOF to Yameen's personal account at the Maldives Islamic Bank (MIB). Yameen said that the funds were not deposited to the escrow account set up at Bank of Maldives between himself and the ACC, as instructed by the graft watchdog, due to suspicions on the lawfulness of the funds. The funds were deposited to another account of the Yameen at Maldives Islamic Bank (MIB) instead, and he refrained from utilizing the funds as he did not wish to bring on additional accusations on himself, revealed Yameen. 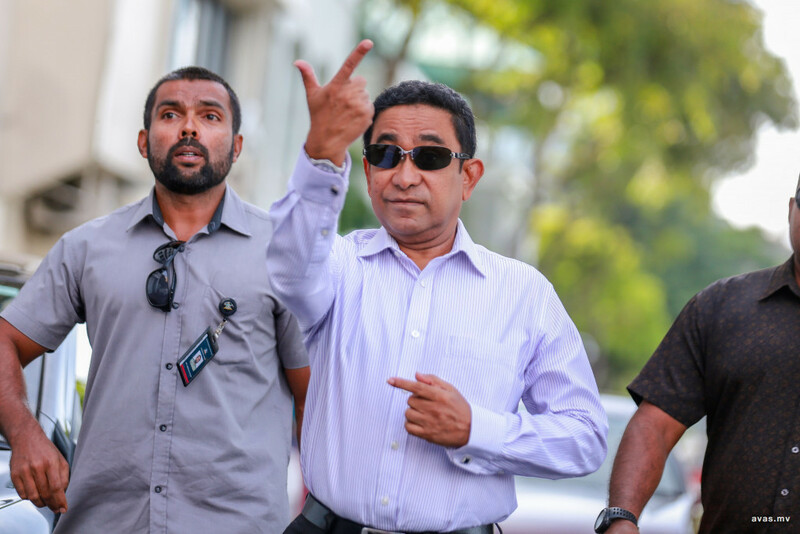 The movement of the funds between the accounts cannot be deemed as money laundering as he himself was not aware of the initial deposit, said Yameen. A few months ago, Al Jazeera cited a confidential letter sent by the country's anti-money laundering body to the police saying the then president received the money in two installments to a private bank account at the Maldives Islamic Bank (MIB). The document from the Financial Intelligence Unit (FIU), an agency under the Maldives' central bank, was dated September 13 and was addressed to the then acting police commissioner Abdulla Nawaz. In the letter, the FIU said a third party deposited USD648,508 in hard currency into the president's account on September 5. Another USD810,635 was deposited to the same account on September 10. The whole amount was later withdrawn in hard currency, Al Jazeera said referring to the letter. The former president has continued to deny the allegations insisting that he had done nothing wrong.